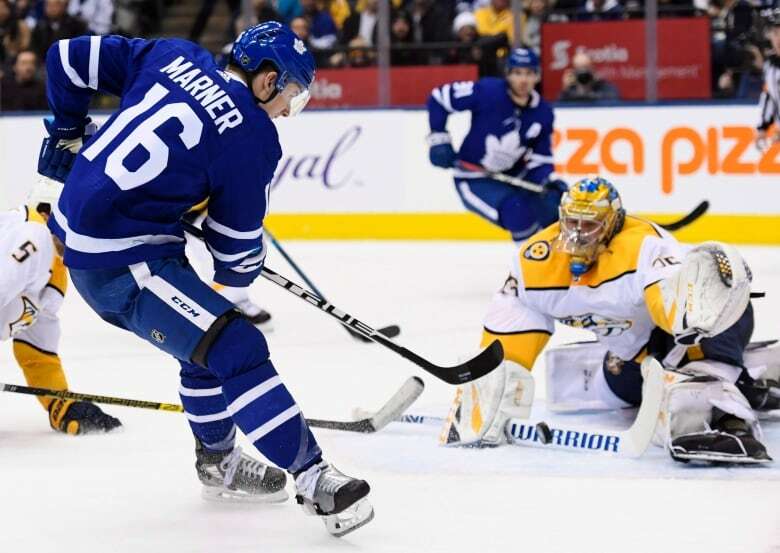 Pekka Rinne made 18 saves for his third shutout of the season and the 54th of his career as the Nashville Predators blanked the Toronto Maple Leafs 4-0 on Monday. Class was in session for the Maple Leafs on Monday night. Toronto head coach Mike Babcock was clear in his grading — they didn't pass the test. "We got a lesson from a veteran team," Babcock said. "In the third period in particular ... they just stayed patient. "They were heavy on the puck, heavy on their sticks, detailed, blocked shots, competed. I liked their game." Mattias Ekholm, Kevin Fiala and Colton Sissons had a goal and an assist each for Nashville (26-15-3), while P.K. Subban also scored. The shutout was the 54th of Rinne's career to tie him with Marc-Andre Fleury, Bernie Parent and Ed Giacomin for 21st on the NHL's all-time list as Nashville improved to a league-best 22-2-0 when leading through two periods. "Defensively, we played a great game," said Rinne, who had 23 shots blocked in front of him. "They have a dangerous team." Michael Hutchinson made 28 saves for Toronto (27-13-2), which hit three posts and also had a goal called back for offside. "Sometimes that's just the way it goes," said Leafs centre Auston Matthews, who found iron twice. "It's no excuse in this locker-room." Toronto was coming off one of its most complete performances of the season in Saturday's 5-0 win over Vancouver, but has now lost three of four — including getting shut out for the second and third time this season — after winning five straight. "It was a tight game," Leafs centre John Tavares said. "They've been through a lot of battles over the last few years and have really proven themselves and know how to win." Monday's tilt was the third in four nights for the Predators, who opened their season-long six-game road trip with a 4-3 overtime loss to Detroit on Friday — a performance head coach Peter Laviolette called "awful" — before Saturday's 4-1 victory over Montreal. 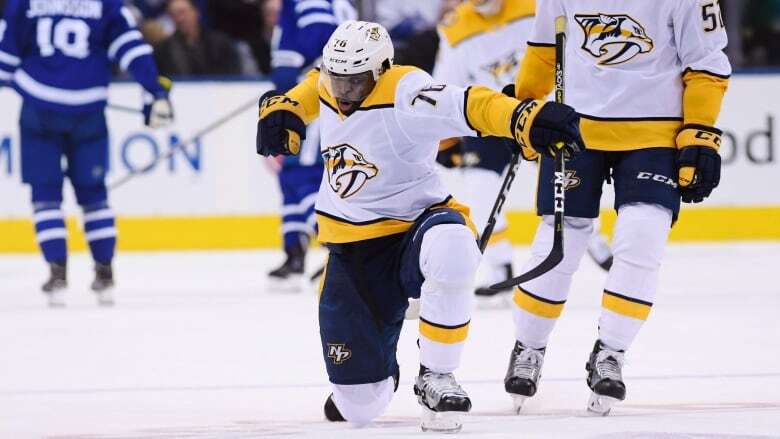 "The past two games, that Preds hockey," Subban said. "That's the way we play when we're playing our best. We make it tough." After a scoreless opening 20 minutes, the Predators went ahead at 4:08 of the second when Ekholm's scored his fifth of the season on a shot from the point through traffic that beat Hutchinson, who made a third consecutive start with No. 1 goalie Frederik Andersen (groin) and backup Garret Sparks (concussion) out injured. Toronto appeared to tie the game 43 seconds later when Matthews connected on a no-look pass from Andreas Johnsson. But the goal was called back when the Predators correctly challenged that William Nylander was just ahead of the play as the Leafs entered the offensive zone 18 seconds before the Leafs scored. After Rinne stopped Johnsson on the doorstep, Subban made it 2-0 with his fourth at 13:11. The Predators won an offensive zone faceoff before the Nashville defenceman, who was playing his seventh game back after missing 19 with an upper-body injury, ripped a one-timer that deflected off Nylander's stick at the point and sailed past Hutchinson. "He's got to get better," Babcock said of Nylander. "All the details, all the compete, all that stuff has just got to keep getting better. "The urgency level has to be there." Rinne was there again to rob Mitch Marner late in the period as Toronto mustered just 14 shots through 40 minutes at Scotiabank Arena. Nashville, which came in having won three of its last four on the heels of a six-game skid, got a power play early in the third, but the best chance came on Toronto centre Frederik Gauthier's partial breakaway that saw him fire over the Predators' goal. Toronto got its third opportunity with the man advantage later in the period, but Matthews found iron for the second time with Rinne out of position. Hutchinson kept his team in it with a glove save on Viktor Arvidsson with six minute left in regulation, but Sissons and Fiala each scored their eighth goals of the season in the game's final three minutes. "They're a top-2, top-3 team in the league," Subban said. "We did a good job limiting their top players' opportunities." It could have been different with a little luck for Toronto in the first period. Matthews blasted a shot off the post before Kasperi Kapanen also hit iron, but Babcock said his team didn't do nearly enough overall. "Their players were playing a real game," he said. "We didn't hold our end up."